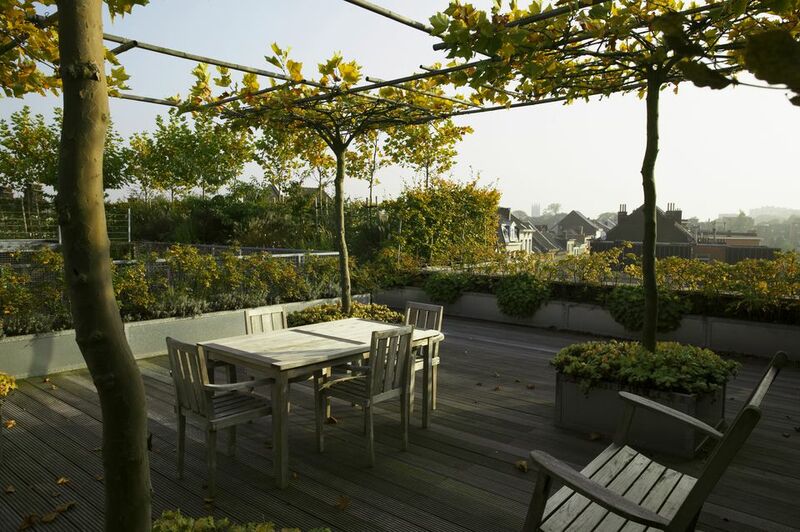 Rooftop gardens can be an oasis in an otherwise built-up urban setting. Gardening on a rooftop has a lot to recommend it - privacy, good sun, no deer - but there are several things to consider about urban gardening before you start planting. If you've gone through the logistics and have decided to create your own rooftop garden, here's how to get started. Containers: Containers are one of the most expressive components of a rooftop garden. This is where you can express your style. That is not to say you need to spend a fortune on them, although you easily could. Besides aesthetics, there are two things to keep in mind when choosing your rooftop containers are size, weight, and material. You will need containers large enough for the roots of whatever plants you choose. The amount of soil needed will vary, so research your choices, before you plant them. You will find a lot of plants labeled as "Great for containers." The weight of the container becomes an issue if you are worried about how much your rooftop can support. Remember, containers get even heavier when you water them. Traditional materials, like clay, terra cotta, and cement, can be quite heavy. Plastic pots and the newer synthetic containers are light enough to lift. But you also need to consider balancing the height of your plants. A tall or top-heavy plant, like a small tree or a tomato plant full of ripening fruits, will topple over in a lightweight pot. If your rooftop garden is windy, heavier containers will be a must. Soil: Soil is often the last thing to interest a new gardener, but it is the most important part of your garden. Good soil means healthy plants and less work for you. If you are growing in containers and raised beds, you will have the advantage of bringing in soil. There are several good potting mixes on the market or you can mix your own by combining 3 parts compost or composted manure with 1/4 part peat, for lightness. Add a handful of perlite per pot, for improved drainage. The soil in containers needs to be replaced periodically, usually every spring. You can lift and repot or simply top dress the existing soil. Fertilizer: Container plants will require regular fertilizer. Even a great potting mix will become depleted over time, as plants take up the nutrients and the water leaches them out. The larger a plant grows, and the more water it takes, the faster the soil is depleted. The type of fertilizer you use will determine how often you will need to fertilizer, but every 2–3 weeks should be sufficient. There are many good fertilizers on the market, including increasingly more organic choice. A water-soluble fertilizer is the fastest way to get the nutrients to your plants, either by watering the soil and getting it directly to the roots or by foliage feeding. Plants: You can plant virtually anything in a container. Since most rooftop gardens get very hot during the day, drought tolerant plants are recommended. You will also need to take into account your sun exposure and hardiness zone. Since rooftops hold heat, they can create microclimates that hover about a zone higher than a garden on the ground would be. You'll need plants that can handle the heat, but since they are in containers, they probably won't have better cold tolerance than ground planted gardens. There is no list of certified rooftop hardy plants. Your choice of plants will require some trial and error. Honestly, with the exception of tall trees, there is little you can't grow on a rooftop. Many rooftops are little microclimates that can overwinter plants that would not be hardy at ground level. And if you have space and are willing, you can bring tender plants indoors for the winter. Annuals will require more frequent watering but will eat up the sun. Some good rooftop plant choices would be plants with limited root systems, that don't need a lot of soil, like herbs and vegetables, smaller to mid-sized perennials. Trees and shrubs require more soil and larger pots, but you need less of them to make an impact. Tools: You'll need far fewer tools for a rooftop container garden than you would for a traditional ground level garden. You'll be doing a lot of scooping and filling. A trowel and perhaps a soil scoop, are the first tools you'll need. A small tarp will come in handy when you are emptying soil, to keep from making a mess. The only other essential tool would be a good pair of pruners, to prune and clean plants. After that, it all depends on what you're growing and how much maintenance you intend to do. That should get you up and growing. Unfortunately, even a rooftop garden will be subject to pests and problems. Insects can fly, as can spores, so you will still need to monitor your plants and try to catch problems while they're small. Keep your plants healthy and stress-free by keeping them fed and watered, and you will limit their problems. Pot feet will lift your pots off the floor, allowing for better drainage. Don't let cost keep you from gardening. A kiddy pool makes a wonderful raised bed, suitable for growing just about any kind of vegetable. If you are going to be moving plants around or moving them indoors and out, place them and leave them on locking dollies.